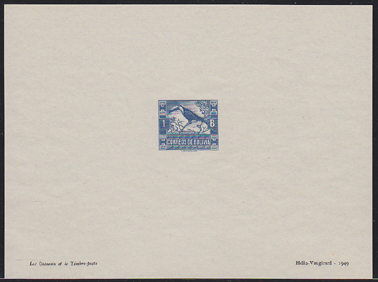 15596 EP BOLIVIA (1939) Toco toucan*. Presentation proof printed by Helio-Vaugirard in 1949 to demonstrate their printing techniques. Scott No 264, Yvert No 235. 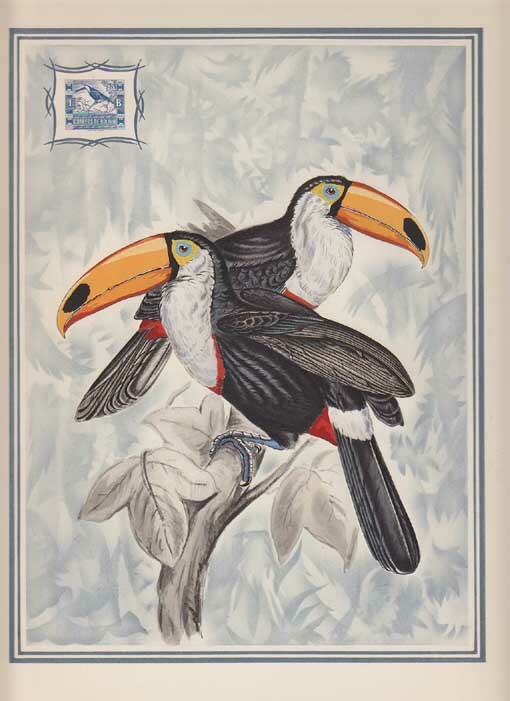 15601 EP BOLIVIA (1949) Toco toucan*. Oversized (20 x 26 cm) proof card with image of stamp and much larger plate reprinted from a drawing of Gould (1842). These proofs were printed by Helio-Vaugirard to demonstrate their printing techniques. Scott No 264, Yvert No 235. 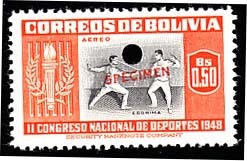 11308 EP BOLIVIA (1951) Fencers. Specimen overprint with control punch. 5th South American Games series. Scott No C152, Yvert No PA129.